Why I Do What I Do Hop ‘Til You Drop! In Mexico, it is time to celebrate the lives of those who have left this earth. El Dia de los Muertos (Day of the Dead) is one of the major celebrations of the year. While death is not welcomed, it is also not feared and forgotten here. It is a day of remembering and reminiscing about the lives of those that are gone. Altars are built to observe and honor the people we have loved. Designed with memorabilia of that person’s life such as favorite food, drink, possessions and photos with lots of flowers and candles. The altar represents what this person meant to us in our lives. The Day of the Dead also brings into focus one of the greatest differences between Mexican and USA cultures. Mexicans keep death and dead loved ones close, treating it with familiarity, hospitality and acceptance instead of dread and denial. 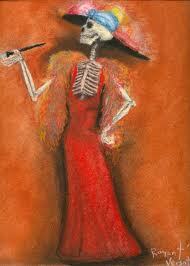 La Catrina (skeleton woman of death) embodies that philosophy and has come to symbolize not only El Día de los Muertos; it also represents the Mexican willingness to laugh at death itself. 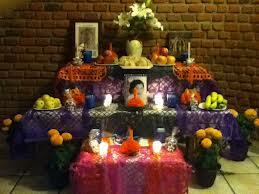 While La Catrina always bring a smile to my face, I find myself wondering what my altar might look like after I am gone. What will my friends and family remember about me? What important items will show up next to my photos? Would I be at peace with this creation designed by the most important people in my life? During a coaching class that I am taking, the instructor asked us to ponder on this question, “What legacy did I want to leave behind?” So what perfect timing to spend some time thinking about this very powerful and possible life-changing question. Yes, I have some of my answers, yet if I dig deeper, I feel I will find what is truly important to me. Most of all, if I delve seriously into this question, I will find out how to live the rest of my life from here on out! Whenever think of death and what I want to leave behind, I think of my mother. Mom was always comfortable speaking of death, in particularly her own. I still can hear her saying, “When I am dead and gone…” then she would proceed to tell me to always remember a certain family story; what she wanted to happen when she was dead; what item she wanted me to have or more often, some saying that would make me laugh while bringing an “aha” moment to remember.